Delectible oyster flavors with very original names are normally sourced within a day's journey on the Eastern Seaboard. We like 'em fresh! In fact, Patty's Fattys are grown right here in the Bay by the Mahoney's, a true original Eastport-Annapolis' family of local watermen (more about Pat Mahoney) . The big question of what do you do with those empty 90,000 shells was answered by joining the Oyster Recovery Partnership. Each and every shell from those deliciously slurpy oysters make it back to the Bay in the form of re-populating oyster beds. As natural filters, they generate optimally cleaner water - ultimately our guests and the Boatyard directly impact the health of the Chesapeake Bay! 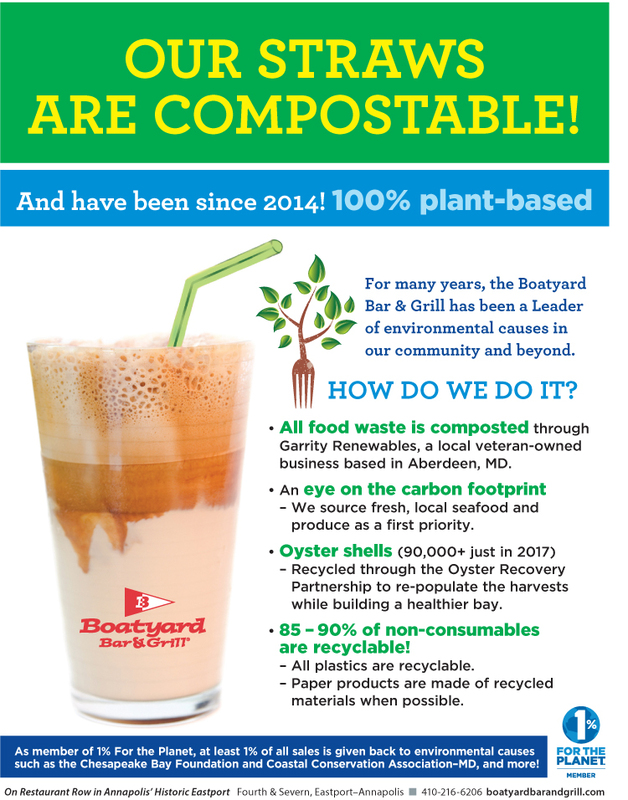 The Boatyard Bar & Grill - committed to a healthier Bay, pint drinks, sailing fast, fishing with friends and happy kids!